Chuck E. Cheese Retires Its Animatronic House Band, The Pizza Time Players The CEO of the company that runs Chuck E. Cheese pizza parlors says its animatronic house band simply can't live up to the expectations that kids today have for entertainment. 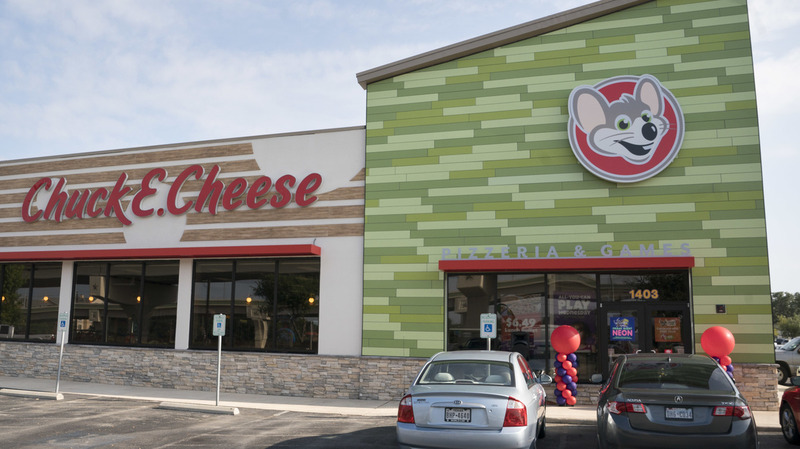 Chuck E. Cheese's recently renovated San Antonio restaurant. The chain has plans to update its look inside and out — and will retire its (animatronic) house band. First, it was The Supremes, then The Beatles, then The Police. Now there is news that another enduring band is breaking up: Chuck E. Cheese's The Pizza Time Players. Chuck E. Cheese — a large rat puppet with a New York accent — along with his fellow animatronic pals sing and shake their mechanical limbs to cover tunes in about 500 pizza restaurants nationwide. Tom Leverton, the CEO of the company that runs Chuck E. Cheese and its sister restaurants, Peter Piper Pizza, says the animatronic characters have been in the restaurants since 1977. "Back then, kids' expectations of technology were much, much lower," he says. "A child today has such high expectations for entertainment that the animatronics, even at their absolute best, can't live up to those expectations." Now, in case you've never been to one, children flock to Chuck E. Cheese restaurants to fill up on pizza, french fries and soft drinks — and then burn off all that pent-up energy playing video games and dancing to the Pizza Time Players. The animatronic characters are equal parts charming and creepy. In some older Chuck E. Cheese locations, it's hard to hear the music over the creaking and clacking sounds made by the mechanical gizmos inside the puppets. One YouTube video celebrates the 10 best Chuck E. Cheese animatronic malfunctions. But many parents who have an appreciation for things that don't age well still have a warm spot for Chuck E. Cheese and his friends. The problem is, says Leverton, "what we need to focus on is creating that magic for the new generation of kids that are coming in for the first time." If you're worried you might have missed a farewell performance of Chuck E. and friends, fear not. The mechanical bands will be gradually phased out over a few years — and a Pizza Time Players "reunion" concert may be closer than you think. Leverton says some Chuck E. Cheese fans have "purchased or found a lot of our old animatronics and built the full band in their garage and they programmed the animatronics to play with their music. It's exciting to see that as someone who grew up with the concept." So Chuck E. Cheese, we raise a slice of pizza to you. Rock on.